A sea of music lovers, foodies and families flooded the intersection of Crenshaw Boulevard and 39th Street on Saturday, October 20th for the 13th Annual Taste of Soul, presented by Hyundai Motor America. For its third year, Hyundai invited festival-goers to “Reimagine Everything” at the Hyundai Sound Stage and activation pavilion through live music, a fan experience and a car give away. The Hyundai Sound Stage presented some of the most respected icons in music. The lineup included Hip-Hop legend Kurtis Blow, R&B diva Chanté Moore, R&B legend Ginuwine, King of New Jack Swing Teddy Riley featuring Blackstreet and Soul songstress Melanie Fiona. The stage was hosted by journalist and political commentator Roland Martin and popular sounds were provided by DJ B-Hen. The stage was well secured with members of the LAPD and Nation of Islam, keeping everyone safe along the busy barriers. The Hyundai interactive pavilion provided a Jeopardy-like Black history game, where contestants won prizes, charged their phones and refreshed with cooling off stations. The main attraction was the chance to win a sparkling new 2018 Hyundai Kona Limited. Participants who entered the contest will be notified in November. The performances kicked off with the StarQuest Singing Competition. The ten contestants, five children and five adults all competed for the chance to win a $500 prize, and the opportunity to perform and celebrate just a few blocks away at the Wave Stage. Behind the scenes, contestants nervously awaited backstage and drank plenty of water to stay hydrated to give their best. Some sat and kept quiet to themselves, while others rehearsed and listened to words of encouragement from friends and family. In between sets, Crenshaw High School Drumline performed flawlessly in front of proud and excited parents in their traditional royal blue and gold colors. People rushed to the food lines to grab a quick snack and drink, then hurried back to their seats. And for those who did not have seats, they stood and danced as the crowd extended for yards. Luckily, there were multiple LED jumbotrons for the late arrivers to view the acts. Teddy Riley featuring Blackstreet performed their grammy winning song “No Diggity”, with dance moves in synch for their entire set. Ginuwine made a sea of women swoon while he serenaded them with his classic love songs and tossed roses to fans. He also walked and sang through the crowd as excited fans snapped selfies with him. 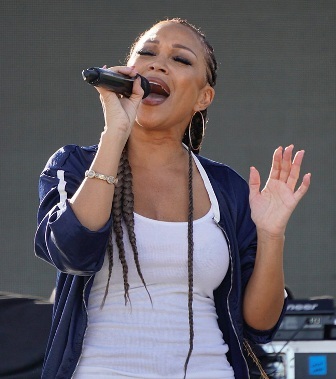 Chanté Moore was well anticipated as a front row fan screamed out to her to perform her hit “Chanté’s Got A Man”. She smiled and let her fans know that song is next. Kurtis Blow had everyone on their feet, as he gave a true hip-hop legendary performance which included a team of talented break dancers. He passed his mic for one lucky fan to sing-a-long to his hit “The Breaks”. Kurtis yelled into the crowd “If you believe in a God, say oh yeah!” The crowd raised their hands and screamed in an uproar. He also encouraged everyone to vote on November 6th. Melanie Fiona closed the night with her fan favorite “It Kills Me” under blue lights and expressed how happy she is to be back performing at Taste of Soul. The crowd sang along as they waved their flashing Hyundai glow sticks in the air. 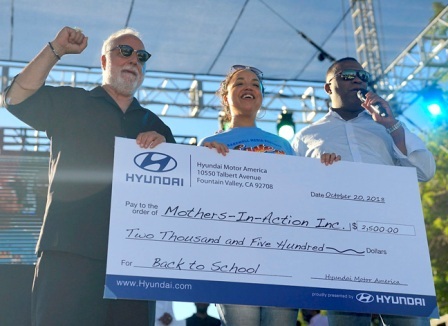 Hyundai also presented four philanthropic donations to Mothers In Action, Brotherhood Crusade, Amazing Grace Conservatory and New Image Emergency Shelter for their work in social justice, school supplies, social services and performance arts. Zafar Brooks, Director of Corporate Social Responsibility and Diversity and Inclusion at Hyundai Motor America and Bakewell Media Chairman and CEO, Danny J. Bakewell, Sr. thanked everyone for coming out and keeping the spirit of Taste of Soul alive. “The 2018 Taste of Soul Family-Festival weekend in Los Angeles was an amazing success,” said Brooks. “From the first event on Friday night at the California African American Museum, to the incredible Saturday TOS festival on Crenshaw Blvd, The Taste of Soul weekend was a celebration of the beauty and love within the community. We were extremely proud of our third-year partnership with Bakewell Media and The LA Sentinel to bring this 13th annual event to the community. It was a fun-filled way for Angelinos to come out and celebrate together to celebrate the joy, artistry, and beauty of our community. There were hundreds of incredible vendor booths, wonderful food options, and tremendous community fellowship. “The Hyundai theme for this year’s TOS was ‘Re-imagine Everything.’ Our theme was created with the idea that together, we can strengthen the greater Los Angeles community. The Hyundai activation included a Consumer Experience tent, VIP Hyundai Lounge, The Hyundai Sound Stage, and a enter-to-win chance to win a new 2018 Hyundai Kona SUV. 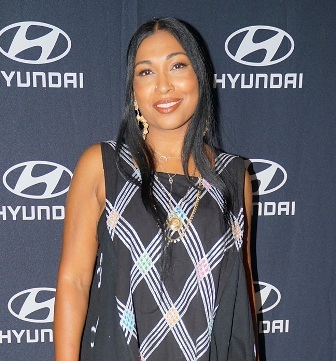 The Hyundai Sound Stage with an award-winning performing artist line up, included Teddy Riley and Blackstreet, Ginuwine, Chante Moore, Kurtis Blow and Melanie Fiona, who entertained the crowd of on-lookers. Multi-media personality Roland Martin hosted the stage. Overall, the day could not have been better, with awesome LA weather and a tremendous turnout of over 350,000 participants. We congratulate Bakewell Media, LA Sentinel and The Taste of Soul for executing another outstanding event,” concludes Brooks. Bakewell Sr. took the time to capture a personal selfie of him and the crowd to document how proud he is of his vision. A vision of black owned businesses coming together to support and strive in the heart of Los Angeles, the Crenshaw District. The city deserved that joy.